On October 19, Canada is electing a new parliament and therewith a new government. As the fifth largest oil producer in the world, the country’s domestic and foreign policy is shaped considerably by energy and resource issues. In the nine years under the Conservative Prime Minister Stephen Harper, Canada has focused primarily on its oil industry and on strengthening its position as an energy power – without regard for the environment and local populations. In that context, the Harper government presented economic growth as being dependent on an aggressive expansion of the energy sector. However, that line of reasoning is now losing its force. The signs for that shift are on the wall. In the first election debate between the main candidates on August 6, 2015, energy and climate topics consumed at least one quarter of discussion time – in stark contrast to 2011, when the issue was largely ignored. Indeed, the competition of this campaign revolves around putting Harper’s energy policy to the test and to crafting a new sustainable energy policy. How might we understand this shift? Apparently, the Canadian environmental movement has managed to put climate and a sustainable energy policy onto the political agenda. Energy market expert Erin Flanagan from the Pembina Institute, a Canadian energy think tank, has noticed a fundamental change in the public perception of environmental topics. Canadians, similar to their neighbors to the south, are beginning to understand that we no longer have to choose between economic growth and environmental protection and that, instead, both have to be a part of a sustainable growth strategy. In addition, the drastic drop in oil prices is forcing Canadians to realize just how dependent their economy is on the energy market. Invariably unpredictable, this market is characterized by unstable oil prices as well as by uncertainties in the pipeline business. Canada exports the large majority of its oil, mainly to its southern neighbor the United States. In that sense, energy policy in Canada is also – and especially – a matter of foreign policy. This has become particularly evident with the Keystone Pipeline, the most prominent of the proposed pipeline projects, designed to transport oil from the tar sands in Alberta to the Gulf of Mexico through the United States. However, and after years of planning, the Keystone Pipeline is still not secured, as it requires approval by the president of the United States. According to rumors circulating in Washington, he is poised to reject the megaproject outright, namely because of the pipeline’s questionable carbon footprint. Throughout all this time, the Canadian government has put great efforts into gaining the approval for the pipeline; in fact, this goal has been one of the main objectives of its foreign policy with the United States. If rejected, the pipeline builder TransCanada will have to investigate new routes through Canada. However, resistance against such endeavors is growing within the country. In recent years, environmental groups and the First Nations (the federation of Canada’s indigenous peoples) have successfully mobilized against the construction of other pipelines. The economic prospects of a country play a crucial role in any election campaign. At present, Canadians are wondering whether Canadian economic growth could be maintained even with a different, more sustainable energy policy. Yet Prime Minister Harper is dismissive about that possibility, while continuing to condone extremely low environmental standards for energy projects – by way of which he is making himself open to attack. But more importantly: Canada’s economy is shrinking. For this reason, Harper’s challengers are demanding new solutions for smart and sustainable growth that would equip the country to deal with the challenges of the 21st century. In the election campaign, Prime Minister Harper’s energy and environmental policy is increasingly made responsible for Canada’s bad energy image, especially in Europe, due to its oil exports (Fuel Quality Directive). Harper is accused of having promoted oil extraction at any cost. For example, it is only by neglecting or overriding environmental standards that the controversial oil extraction from tar sands can take place. The technology and machinery used in this kind of oil extraction consumes vast amounts of water and energy. In fact, Canada’s tar sand operations have already contributed significantly to the increase in Canadian CO2 emissions. 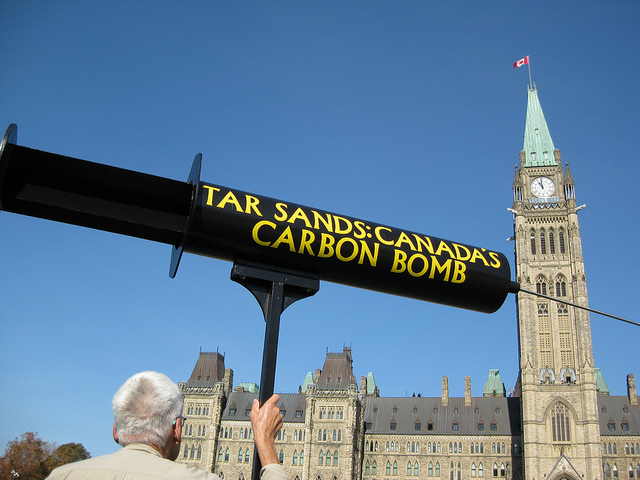 Thus, a sustainable approach to tar sands oil extraction is crucially important, especially since tar sands comprise about 98 percent of the suspected oil reserves in Canada, and because their extraction accounts for about two percent of Canada’s economic output. Energy policy will always play an important role in election campaigns of a country like Canada, especially when it comes to generating new economic growth. During his term, Prime Minister Harper fought fiercely to push the exploitation of domestic oil – at any price, and thus at the expense of the environment. However, the drop in oil prices and a more organized environmental movement are now fueling and invigorating the debate over adopting a different, more sustainable energy policy. On October 19, we will know whether the Canadian population is ready for this change. This comment was first published on us.boell.org. "We need to restore responsible government"
Canada votes on October 19. An interview with Elizabeth May, Member of Parliament for the Green Party, about Canada’s climate performance, the state of democracy, and the prospects for her party in the upcoming elections.